Revolights: These lights have been spotted in Boston and nationwide an illuminate as the tires spin, creating an easily detectible brightness and motion. This will likely get a driver’s attention, even from a distance. These lights are mounted on the tires and sensors will calculate the rate of wheel spinning, creating an on and off LED effect. The lights are visible from the front, back and sides of the bike. Sense Lights or Daylight vision lights: Many cars and other vehicles are designed with daylight running lights and the same idea applies here. Bikes can be more easily seen during the day with lights using “smart sensor technology” adding light to certain situations. The lights are able to conserve energy when necessary and turn on when a rider needs extra light. Loud Bicycle Horn: This added safety feature was developed by a student-engineer in Boston. The horn is set at 112 decibels, mimicking a car horn and matching the tone of a car horn, making more drivers aware when they are about to crash into a cyclist. Smart handlebars: These are lights at the end of handle bars to simulate turn signals and turn on and off when linked to GPS. They are brights in the front and offer two other lights in the back which offer signal directionals. The Hövding: This invention has been garnering a lot of attention in UK and throughout Europe for its stylish and effective safety features. Essentially, it is an airbag that deploys when a rider within the second of a crash creating a helmet around the head. The company has performed crash tests and is comparable to other helmets in reducing head injury or fatal injury. One of the other benefits is that the air-helmet is lighter and can be worn around the neck rather than the hair. Riders can essentially wear a helmet that is undetectable. 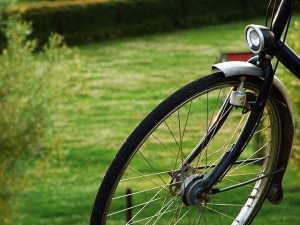 According to reports, three-quarters of bike accidents occur in urban areas. This means that bikers need to take every necessary step to increase their visibility on the road, especially at night and in high traffic areas. Though bike designs don’t change too much, the lights and accessories you use on your bike could save your life.